Top-quality plugins at up to 89% off! iZotope has fired the starting pistol on its Black Friday sale, and what a sale it is. One of the more eye-catching deals is the Stutter Edit and BreakTweaker Expanded bundle, which can be had for $49 down from $448. That’s a saving of 89%, which we’d say is pretty massive. The Trash 2 Expanded and Iris 2 bundle is also down to $49, this time from $298. A mere 84% off that one, then. Elsewhere, the Creative Suite 2 is half price at $249. This includes VocalSynth 2, Iris 2, Trash 2 Expanded, BreakTweaker Expanded, Stutter Edit, DDLY, and Mobius Filter. A real galaxy of software stars, in other words. For mixing and mastering, Neutron 2 Standard and Ozone 8 Standard are both down from $249 to $99 (that’s 60% off), while you can have them together in the Mix & Master bundle for $149, which is reduced from $498 (that’s a 70% saving). If you want the Advanced versions of Ozone 8 and Neutron 2 you can have them in the 08N2 bundle for $349, which is half price. 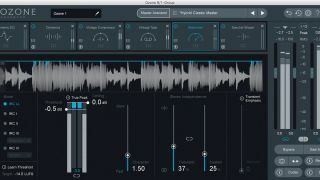 The Nectar 3 vocal processing software, meanwhile, has had its price trimmed from $249 to $199. Finally, there’s the big daddy: Music Production Suite 2. Containing more than 30 plugins, this is available for $599, which is 40% down from the regular price of $999. Browse all the deals and grab yourself a bargain on the iZotope website.